Most modern malware operates as part of a system. Whether it’s a multi-part kill chain with droppers and payloads, a botnet with command and control servers, or ransomware encrypting files, the malware on the compromised system talks to other systems over the internet. If you have been compromised, and didn’t catch malware on the way in, you can often find it by monitoring outbound network connections. 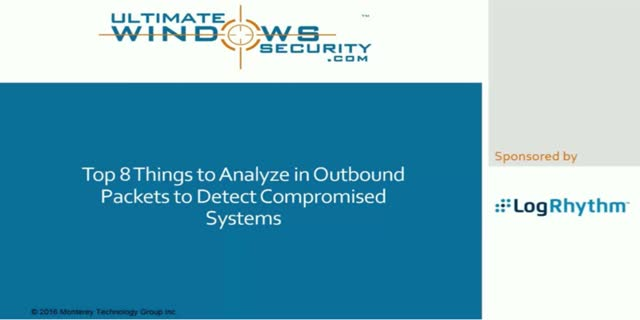 In this webinar, Randy Franklin Smith, Windows Security Subject Matter Expert, and Rob McGovern, Sr. Technical Product Manager at LogRhythm, discuss the top 8 things to analyze in outbound connections from your network to the Internet. The duo also shows you how Network Monitor tools can help you improve your network analysis and forensics capabilities. Join this webcast to learn how monitoring your network can help you detect and investigate potential malicious behavior within your IT environment.